my Great Uncle and I found out quite a bit about him and his crew through research. post and never heard of again, such was the calamitous error he had made. Wow, a sad error there. Welcome to the forum Wilesy. wilesy...interesting to read your post. 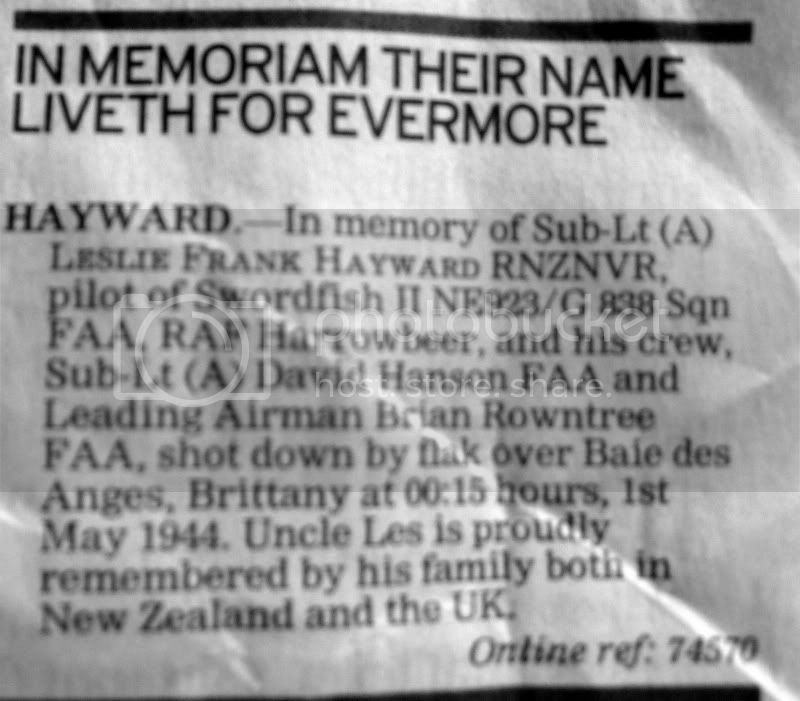 Tragic that the Swordfish were tasked with that - one of the many SNAFUs that accompany war. Like many others, I guess, I hadn't heard of this obscure mission and loss of life. Find the Telegraph very interesting for some obscure notices and often wonder about who put the announcement in. Thanks for the replies guys, greatly appreciated. And the photo, I only discovered that recently on the AWM website. Amazing. It's not a family photograph so must have been taken when he was over in the UK. There's always snippets of information coming to light every so often as I find things out; as and when I do I'll be sure to post it here. Nice one, keep up the good work, super website. Is this thesame Leslie Hayward shown here at 3.24? My God I am speechless! That's him! How on earth did you come across this and marry it up to this short thread? I only check this board every once in a while to see if anything else has been added, and by heck has it been added now!! Thanks to you I'm going to be on the blower to NZ from the UK all night now, getting various relatives to log in and see this. Although just a couple of seconds long, to see someone alive who I have spent so much time researching, is quite unbelievable. I'm so so grateful. Les was a railway clerk in Wellington before joining up, so to hear the commentators's words really stopped me in my tracks.. I'd like to update this thread as a lot of interesting events have occurred regarding my Great Uncle Les Hayward since the last post back in 2015. Over the last 10 or so years I have been in touch with a French historian called Gildas Sazaounet who resides in Brittany who has investigated every WW2 air crash site in his area of France. He has done a lot of work on 838 NAS's ill fated raid near the town of Plouguerneau (in which three New Zealand pilots including Les took part). Last year I managed to get in touch with a nephew of Les' navigator who had also been searching for information on what had happened and through Gildas we arranged to meet up at Plouguerneau in late August '16 where he would show us the area of the rocket strike and one of the Swordfish crash sites. Things progressed and I was amazed when Gildas informed me that the mayor of the town wanted to honour Les and his navigator (David Hanson) with an official memorial service. I wasn't quite sure what to expect on the day and attended along with my mother and David's nephew Chris Hanson (I'd managed to coincide the trip with a family camping holiday in Southern Brittany). I must say that I felt slightly nervous as I'd been asked to make a speech in the church yard where four unidentified graves belonging to crew from 838 are situated. Incredibly all members of the local equivalent of the British Legion / returned forces club turned out carrying standards and wearing medals, as well as a sizeable amount of townsfolk. The service was incredibly moving, with the French equivalent of the last post being played, the NZ and Union flags raised, and the mayor (strangely an Englishman) giving a detailed speech in both French and English about why we were gathered this day. I found myself standing next to a woman who I thought was a local councillor but who turned out to be the MP for the area and afterwards I was interviewed by a journalist who I thought was local press... she turned out to be from a national paper with a circulation well into the millions so the next day I was bowled over to see the story and a photo of us all by the graveside in a broadsheet newspaper on a respectable page 7!! After the service had concluded we were taken to a council building where a historical exhibition had been set up with pieces of one of the Swordfish aircraft on show that Gildas had found at one of the crash sites. This particular aircraft had been piloted by Sub Lt Ian Wilson RNZNVR (more about Ian in a bit). The day finished with Gildas taking both David and myself up in a light aircraft and "reinacting" the approach that the Swordfish took on the rocket strike on the German torpedo boat. I can tell you that the respect that the French show to fallen combatants who helped to liberate them is awesome, people really went out of their way to make the day unforgettable. On to Ian Wilson. For some reason (probably due to him being a New Zealander) I'd always tried finding out as much about him as possible. I'd found enough out on line to have a photo or two and that he was from Auckland. When I'd visited his crash site with Gildas I had taken my trusty metal detector with me and I was lucky enough to find several pieces of his aircraft (burnt aluminium off the fuselage) on the hard to reach rocky cove where the aircraft had come down. I took these pieces back to the UK. Anyway, a few weeks later, I got a phone call from my Uncle who lives in Napier NZ who had some incredible news; he'd managed to track down Ian's surviving younger sister, a woman in her 80s called Angela Caughey. I was really struck by what started as a bit of family research on my Great Uncle had led me now to two family members of crew from 838. But I'd never imagined that I would be in touch with someone whose brother had died on the night of 1st May'44. It has been an honour for me to bring closure for Angela on her brother's death as for 70 years she and her family knew nothing apart from that Ian was lost at sea, possibly off Norway. What is even more incredible for her is that Ian actually has a grave, it is one of the four in the grave yard at Plouguerneau. Before the CWGC marked his resting spot with a headstone, it did have a wooden cross with Ian's name on it but for some reason this was all forgotten about when the graves were updated. An old black and white photo that Gildas found clearly shows Ian's name inscribed and this has been sent to the CWGC in the hope that they update the headstone. So this coming northern hemisphere summer, Angela and her family are trekking over from NZ for a memorial service of their own at Plouguerneau, as well as making a trip over to the UK to meet my family. I wonder what Les and Ian would have thought about all this?! Just to end, one of the other four graves at Plouguerneau is also believed to be that of either my Great Uncle Les or his nav David Hanson. I'm torn between leaving it as it is or bringing the story to light to the British MoD who do carry out DNA testing on such circumstances. Seeing as we always thought Les' resting place was the sea, I think it's important to put a name on a headstone. Chris Hanson isn't so sure and maybe thinks things should be left as they are. We shall see. I think there's one more chapter to the story. That is a fantastic update, thanks very much for sharing these recent findings and experiences.